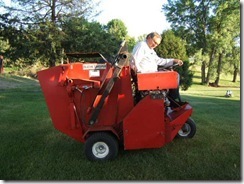 A lot of what we do here is about garden tractors but there is a lot of equipment we work on that have similar repair issues as the garden tractors. We work on them and repower them too. Q: I am replacing the engine on a Ford 340 Skid Loader. The loader has a Wisconsin 30 horsepower VH4D engine, 2800 RPM’s. Can a Briggs 31 horsepower engine be used to replace it? Do you think a hydraulic pump can handle the increase in RPM’s? Have you done this before? A: Yes, we have taken out a 4 cylinder water cooled Continental engine and installed the 31 horsepower Vanguard engine, it is working fine. Your oil pump usually has no more output going at higher RPM’s. If you are worried about the engine speed it can be brought down of course. Q: I am currently repowering a 1994 Yamaha G2 golf cart with a 21 horsepower Briggs V-twin Vanguard. I have it all mounted and ready to go except I have fuel coming out of the pump but it doesnâ€™t seem to be getting into the the carburetor. It has what I think is a 2 wire solenoid coming off the back lower part of the bowl. I think it is the anti backfire solenoid? Will that keep it from getting fuel or is it possible the needle or float is stuck? The way I have it wired it cranks and has enough spark. I think you could weld with it, but it wonâ€™t fire. If I dribble a little fuel down the carburetor it will run but then stops as soon as it is gone. A: You have to get electricity to that wire going to your carburetor electric shut off valve. The wire from your golf cart would be the wire that hooked to your plus side of the ignition coil on your old engine. Q: I have a John Deere SB14 walk behind self propelled mower. The other day it stopped running while cutting grass. I thought I ran out of gas, but that was not it. When I pull the crank the engine runs for about 2 seconds and then dies. Every time I pull the crank I’ll get the same 2 seconds and then die. I suspected the fuel filter, but the gas flows fine with the gas valve open. I still took it apart and cleaned out the fuel tank and filter which were very reasonably clean for an old machine. Suspecting possible carburetor problems I took off the carburetor and sprayed carburetor cleaner through it, it also looked pretty clean. I keep on going back to fuel flow, but I seem to have checked out that area fairly well. Can you offer any ideas? I also replaced the spark plug and tried the carburetor adjustments 1 turn clockwise and 1 turn counter, but this seems to make no change. A: I would check out your ignition spark quality. If you are getting a small spark or if it is orange in color, then replace the ignition coil.